I came across this truly beautiful and colorful salad a couple of months ago on the William-Sonoma website, published February 6, 2015. Then at a recent trip to Trader Joe’s, I found the jarred beets and the lightbulb went off in my brain! Since I have never prepared beets before, finding the jarred beets was quick and easy solution in helping me try out this healthy salad! 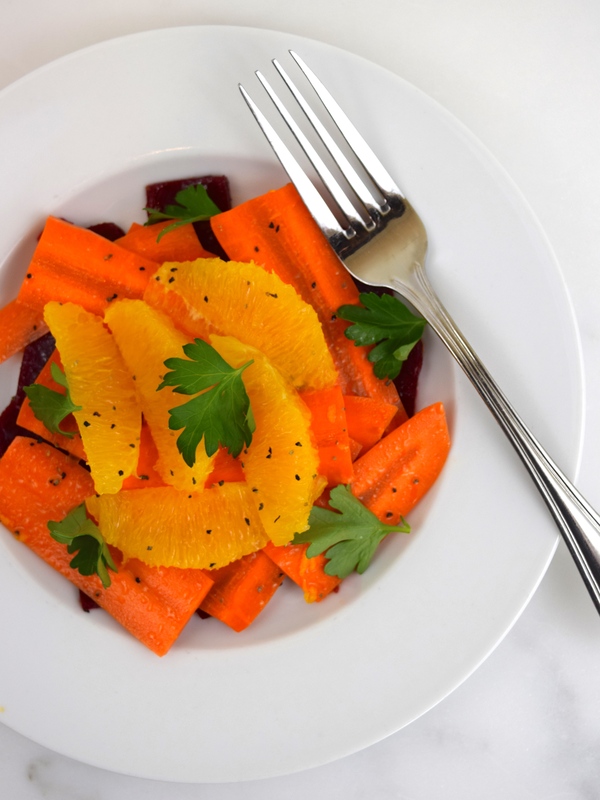 This dish is so refreshing with lemon and orange zest and full of different textures with the beets, carrots and oranges. What a delicious and tasty salad to accompany spring and summer meals! Using a small bowl, whisk together lemon juice, lemon zest, orange zest, olive oil, salt and pepper. Using a mandoline, thinly slice the beets and carrots. With a sharp knife, slice off the both ends of the orange. Then peel the orange, being careful to remove the pith. Cut each side of orange segment to release it from the membrane. In a large bowl, toss the beets with ⅓ of the vinaigrette. Then divide the beets onto 4 to 6 plates. Repeat with the procedure with the carrots and place them on top of the beets. Top the salad with the orange slices and garnish with the parsley. Finally, drizzle with the remaining dressing. Serves 4 to 6. 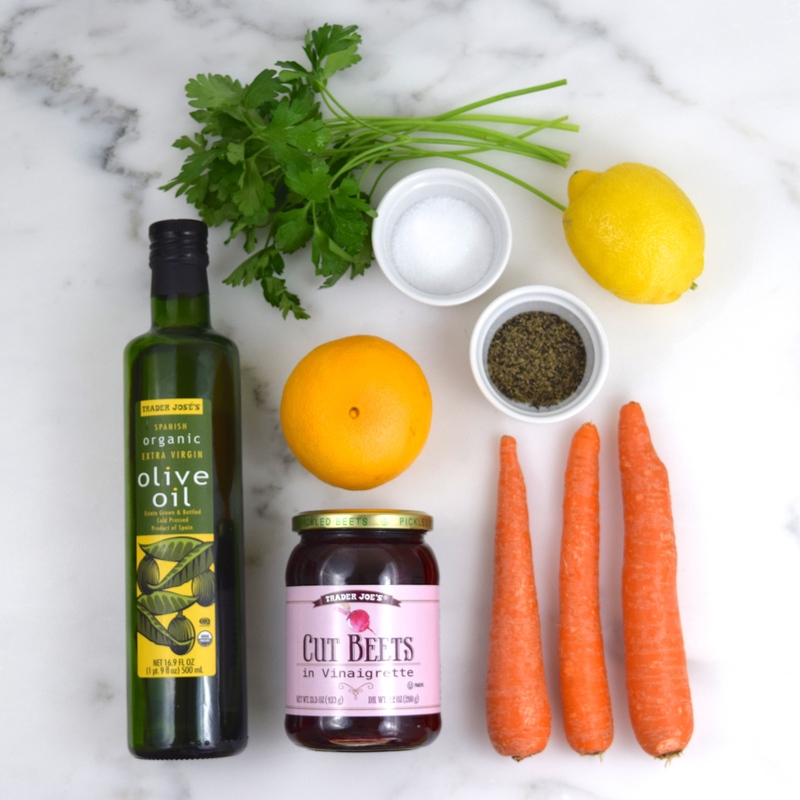 Blogger’s Note: My mandoline did not slice the carrots thin enough, in my opinion, so next time I will try using my vegetable peeler to make the carrot slices. Thank you for commenting, Bonnie. The only thing about TJ’s beets is that they are cut up, so you don’t get the nice “round’ slices. Thats a gorgeous fresh and simple salad. Love the citrus and beets!! I’ve never put beets and carrots together! How pretty is that! I love citrus vinaigrette too. It just says hello spring! Thank you, Julie. I think I may use my vegetable peeler next time for the carrots. My carrots were a little too thick with the mandoline, but the salad had terrific flavors from the beets, carrots and citrus vinaigrette.